What Does Code P2138 Mean? I have dealt with a stored code P2138 on many occasions and I have found that it means the powertrain control module (PCM) has detected a discrepancy in the voltage signal between a particular throttle position sensor (TPS) and a particular pedal position sensor (PPS). D/E refers to a particular circuit, sensor, or area of a particular circuit. Consult a reputable vehicle information source (such as All Data DIY) for specifics pertaining to your vehicle. This code is used exclusively in drive by wire (DBW) equipped vehicles. OBD-II vehicles use the DBW system (in lieu of a cable operated throttle) to help decrease exhaust emissions, increase fuel efficiency, interact more efficiently with stability and traction control systems, and optimize the accuracy of cruise control systems. 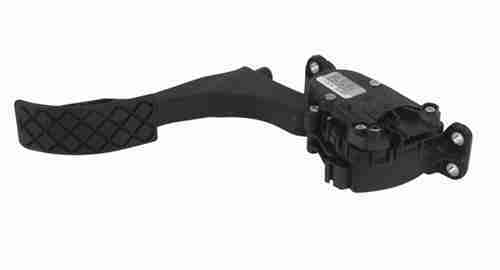 The DBW system is controlled by the PCM using a throttle actuator motor, one or more pedal position sensors (sometimes referred to as accelerator position sensors), and multiple throttle position sensors. These sensors are supplied with a reference voltage (typically 5-volts) and a ground signal. The potentiometer type TPS/PPS completes the circuit. The contacts of the sensor are actuated by a pivoting fulcrum extension on the accelerator pedal or the throttle plate shaft. As the contacts are moved across a circuit board, sensor resistance changes; causing variations in circuit resistance and (therefore) the signal input voltage to the PCM. The PPS sensors are mounted on the accelerator pedal bracket, inside the vehicle. 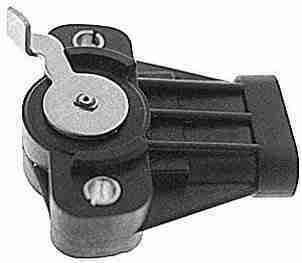 When the pedal is depressed, the PCM receives an input signal to open the throttle plate, as well as a signal letting it know to what degree the throttle plate should be opened. Meanwhile, a signal from the TPS is input to the PCM, making it aware of the actual throttle position. The PCM constantly monitors the signal from the PPS and the signal from the TPS and compares the readings. If the two signal inputs vary by more than the acceptable programmed limit, for more than a certain period of time, a code P2138 will be stored and a malfunction indicator lamp (MIL) should be illuminated. In most cases, the PCM will also enter limp in mode. In this mode, engine acceleration will be severely limited if not disabled. What are the common causes of code P2138? What are the symptoms of code P2138? How do you troubleshoot code P2138? I would normally use a scanner, a digital volt/ohmmeter (DVOM), and a vehicle information source like All Data (DIY) to diagnose a code P2138. The first step of most successful diagnosis is a visual inspection of all system related wiring and connectors. I would also check the throttle plate for signs of carbon buildup or damage. Repair or replace defective wiring or components as required and retest the DBW system. Use the scanner to retrieve all stored trouble codes and write them down for future reference. You may also want to keep any related freeze frame data. Your notes may prove helpful if the P2138 is intermittent. Clear the codes and test drive the vehicle. If the code is reset, continue with the diagnosis. If it is not, the condition may need to worsen before a diagnosis can be made. Continue to operate the vehicle until the PCM enters readiness mode or the code is reset. Consult your vehicle information source for technical service bulletins (TSB) that apply to the condition and vehicle in question. TSBs can be extremely helpful in diagnosing intermittent conditions. Use the information contained in the appropriate TSB to aid in a successful diagnosis. The scanner data stream may yield useful information regarding glitches and inconsistencies between throttle plate and accelerator pedal position sensors. For a more rapid data response, narrow the data stream to display only pertinent data. If no discrepancies are detected, use the DVOM to test the sensors individually. The DVOM can yield live data if the test leads are connected to the correct circuits. Observe the DVOM display while operating the DBW. You are (again) looking for glitches in voltage as the throttle is actuated slowly from the closed position to wide open throttle. Voltage typically ranges from .5-volts at closed throttle to 4.5-volts at wide open throttle. If glitches or other inconsistencies are detected, suspect that the sensor being tested is defective. 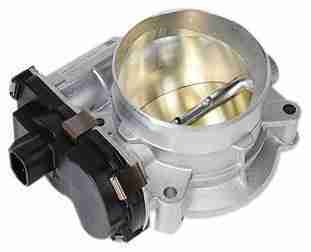 Some manufacturers require that the throttle body, throttle actuator motor, and all throttle position sensors be replaced together.